This page lists all of the Calgary train stores in our hobby store database. A full service hobby store. 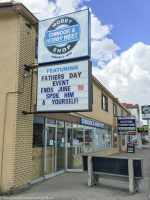 Located on the northwest corner of 50th Ave. & Macleod Trail in Calgary, Alberta. Specializes in European trains such as Märklin and TRIX, and also has Walthers, Athearn and Intermountain among others. PM Hobbycraft is a full service hobby store located in Calgary, with a large model train section.